Eden Island comprises 56 hectares of immaculately maintained accommodation that suits both residents and visitors alike. 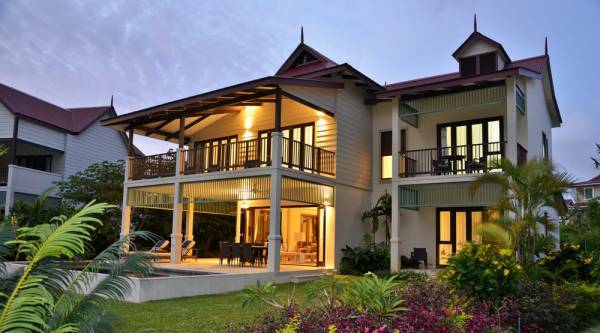 Furthermore, buyers can apply for permanent residency in Seychelles upon purchasing property here. Each home has been tastefully decorated to suit the surrounds of the island, and personal taste of the buyer. The development was designed and constructed to appeal to the global market. It's built on a reclaimed coral reef, boasting access to the archipelago's crystal blue waters, private beaches and lush vegetation. What's more, it's mere minutes from Mahé's international airport which means that getting to and from the island is the least of your worries. Furthermore, island hopping can be a daily activity whether you sail in your private yacht, travel by helicopter, private plane or even motorboat. Chartered transportation is easily obtainable. To date, Eden Island has built and sold almost 500 homes, with some 70 more in the pipeline. Occupation rates on Eden Island range from a minimum of 30% to a maximum of 65% therefore buyers are assured that the development is not overcrowded. The development is divided into six areas, or 'basins'. The real estate marketing started in 2006, and today basins one through four are completely sold out. These properties alone generated a total value of $440million in sales. The year-on-year increase in property value is on average between 8 and 10%. For instance, in 2006 a one-bedroom apartment sold for $275,000, and today the same place sells for $475,000. This means that whether it's new sales or re-sales, there's a continuous demand for property here. Re-sales in the development alone have generated a massive $45million, and approximately 100 properties have been purchased by Eden Island homeowners as second or third properties – proof that this is a sound investment. Furthermore, basin six, which is still under construction, is being re-designed, giving its properties more storage and floor space. Additionally, with the incorporation of two and three-bedroom units, holiday enquiries are expected to increase. This is sure to mean more rentals for seasonal visitors too. Facts and figures don't lie. By investing in property in Seychelles, you not only own an exclusive home in paradise, you join a prestigious community too. These tasteful and exquisite units are sure to make you want to call Eden Island home.